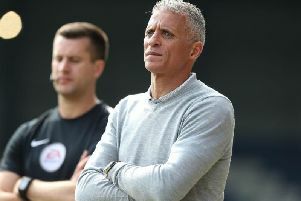 Keith Curle is hoping Exeter City arrive at the PTS Academy Stadium with their sights set on claiming three points on Saturday - as he believes that could play into the Cobblers’ hands. The Grecians are in the heat of the battle to claim a spot in the Sky Bet League Two promotion play-off places. Matt Taylor’s side currently sit in fifth place in the table, but they are only one point better off than eighth-placed Colchester United. With Carlisle United only a further point behind, things are certainly tight at the top and Curle feels that may force Exeter’s hand this weekend. The Devon side were beaten 1-0 at home by Tranmere Rovers last Saturday, and the Town boss feels the pressure is on them to win at the PTS, as a draw would not be a ‘credible’ result. The Cobblers have found themselves frustrated at home at times recently, with lowly Morecambe and Crawley setting their stalls out for, and getting, draws. So if Exeter are more pro-active, that could be a good thing, as long as Town take their opportunities when they come. “If you look at our home performances, we have still created chances,” said Curle. “Teams are coming to us knowing we have a decent home record. “We have drawn a few games, but if we had won a few of those it would have been a very good points return. “Saturday’s game will be a different challenge from the away games we have had, but the players are looking forward to it. “They know that in the Crawley game we had good opportunities in the first half, and if those chances had gone in it would have been a different game, as the opposistion would have had to have changed their mindset. “Crawley came here for a point and they got a point, but do I think Exeter will come here for a point? No, I don’t. “The position they are in now, I think they understand they need wins, and a draw at Northampton would not be seen as a credible point.